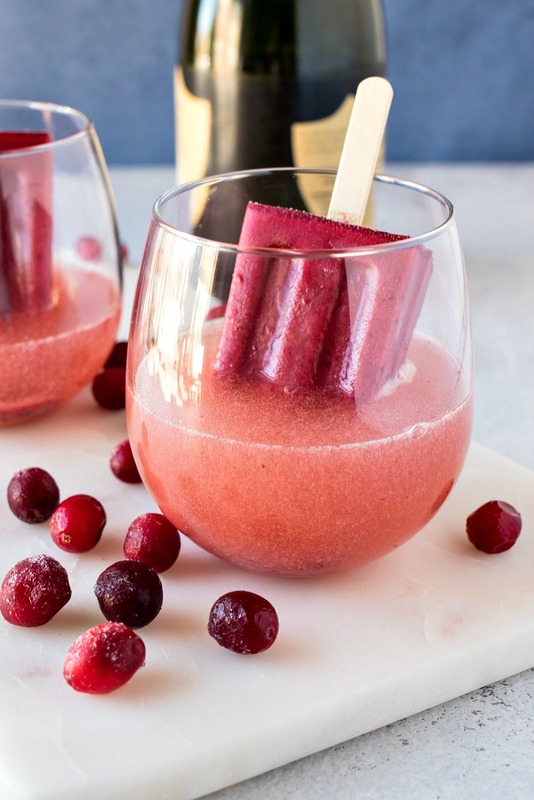 Cranberry Champagne Poptail – A homemade cranberry cherry popsicle in served in a glass with champagne. As the popsicle melts, it creates a fun sparkling cocktail suitable for any party this season! It’s time to get our drink on, guys! You didn’t think I was gonna let you guys go all the way to New Year’s Eve without a stellar cocktail recipe, did ya?!?! With all the drink recipes I already shared with you guys – including the showstopping wine milkshakes and the fan-favorite cranberry lime mojitos– it was gonna be tough to find a cocktail recipe that could live up to them. But then it hit me…I need to share a fun champagne cocktail with you guys. After all, champagne is synonymous with New Year’s Eve, which is less than 2 weeks away. Woah, time has flown by, right?! There’s a local popsicle company that sells these popcicle cocktails – poptails, if you will- where they make a drink and finish it off with a homemade popsicle. They are the cutest things and super trendy and, of course, fun. So today, I am here to make my own version. But instead of worrying about making a fancy cocktail, we’re just gonna use champagne and just make a fancy (yet easy!) popsicle. Say hello to my Cranberry Champagne Poptail! The popsicle flavor that we’ll be making is a cranberry cherry pop. Cranberry is one of my favorite flavors this time of year. In addition to the mojitos, I love making this cranberry apple crumble and these chewy cranberry cookies when cranberries are in season. I just can’t get enough of ’em! These pops are super simple to make. All you do is add the ingredients to the blender and blend for 15-20 seconds until smooth. That’s it! Then you pour into the molds of your choice. I love these metal molds because they’re sleek, use wooden sticks (which I think look better than plastic ones), and are just the right size. If you haven’t made popsicles, there’s nothing to worry about! Popsicles are so super simple to make and not to mention super fun to make because you can get creative and make them your own. Don’t overfill the popsicle molds. Once the liquid freezes, it expands so it will get everywhere if the molds are too full. Don’t overblend the mixture. Too much air in the mixture will cause foam to form on the surface, which will freeze that way too. It should only take 15-20 seconds to get everything mixed together so don’t do it any longer than that. To release the pops from the molds, simply dunk a couple times in warm water. I used a pint glass filled with warm water to help with my molds. And there you have it – a yummy new drink to enjoy all season long. Don’t forget to make these for New Year’s Eve in a couple weeks! A homemade cranberry cherry popsicle in served in a glass with champagne. As the popsicle melts, it creates a fun sparkling cocktail suitable for any party this season! Add all ingredients (except champagne) to a blender. Blend until smooth, about 15-20 seconds. Fill your mold with the blended mixture according to your mold's instructions. Freeze until solid, at least 8 hours. When popsicles are ready for serving, prepare the champagne. Split champagne among 6 stemless wine glasses (or similar glass). Remove popsicle from molds by running mold under a little warm water. Place pop in champagne and serve. Enjoy immediately. This is exactly what I need to cool down when my radiator goes crazy! Can’t wait to try! This looks incredible! I have to try poptails! A popsicle in champagne?! I LOVE it! I’m definitely going to have to give this a try. Talk about a crowd pleaser – these are so incredibly fun and festive! Great flavors, too. 🙂 Pinning for a New Year’s cocktail! So lovely and perfect for the Holidays and especially New Years! Love it! What a great idea! I hate when your drink gets warm or watered down, this is a great solution! Your photography is fantastic, loved the photos. These look so fun and refreshing, especially after a big meal. Nicely done! A poptail!?! That’s a fun party idea, I would have never had such a cool idea. I bet guests would make eyes and cranberry flavor is always a crowd pleaser. Love the idea of combining cherries and cranberries – that must taste amazing! There’s no way I can’t make these poptails for Christmas this year. My guests will love them!! What a fun drink to serve for a New Years party! Love the color, so festive! Aw no worries, girl! These pops will taste just as incredible with sparkling cider! This drink looks so yummy. I’m really taken with the popsicle molds!! I love that they are metal!! I can’t wait to get those molds and try your fabulous cocktail! Me too!! SO glad you like them as well. Let me know how the cocktail turns out for you! What a cute idea! I’ve made wine slushies before, but never melted popsicles in wine or champagne. Sounds like an interesting twist. Much less work than wine slushies, for sure! I’m making these for making these for the holiday! And you’ve got so many to pick from, I’ve been pinning away! Aw thanks so much! So glad you like many of my recipes! Yess! The molds are so great. I hope you love this drink!! What a great idea! I’ve never seen a “poptail” before. (Apparently I live under a rock.) Pinned this to save for a party. Haha no no. They’re relatively new. You gotta try them soon! This looks incredible, and so easy to make. I could definitely see making and indulging in these at a Christmas party with friends or family.